Make sure your employee recognition message is clear. Make sure team members and employees understand your employee recognition message. Even if it’s clear to you, it may not be clear to others. If you have a formal employee recognition program, make sure it’s simple. Too many rules or criteria can cause confusion, and people will simply ignore the employee recognition message. Seek feedback from managers and employees about your employee recognition message. Many managers need to be shown and told how to praise and recognize effectively (they may never have received recognition themselves). Demonstrate and diagram an effective employee recognition message. 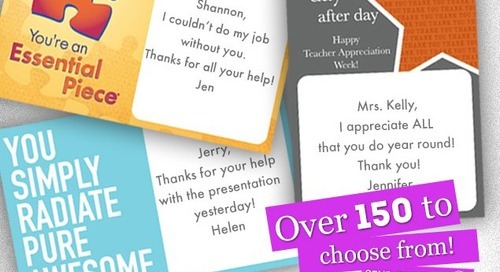 Assemble employee recognition message kits filled with post-it notes, cards, lapel pins, certificate papers and folders for employee awards, how-to guidelines and other rewards for spontaneous recognition. Make it easy for your managers. Put the recognition items at their fingertips. Don’t require requisitions. Create a new theme, new guidelines, new rewards and additional opportunities for employee recognition. Shut down for the day and take your staff outlet shopping. Arrange for a celebrity to stop by and sign autographs. Send the whole crew to a theme park. An employee recognition consultant can evaluate your employee recognition message and suggest additional strategies to take your program to the next level. Learn valuable ideas for recognition tools that make recognition easy in any organization. A great complement to already established peer and daily recognition programs.